Home > Fresh Oysters! > Salt Pond Oysters! 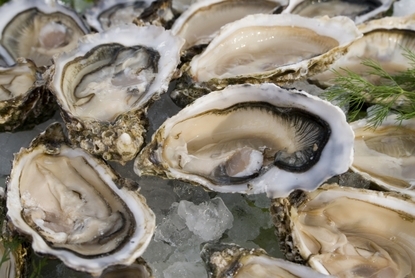 Dave's Oysters have an "Sweet and Briny Flavor" and a "Sweet Ocean Flavor Finish" to them! Salt Pond Oysters are highly popular in East Coast Restaurants and here in new England! These are another excellent Fresh Oyster Choice! Oysterman Dave Roebucks "Salt Ponds" have a Sweet Ocean Flavor and Clean Fresh Finish to them! These are another excellent Atlantic Oyster Choice and come 6 per order! If you are looking for a fresh & sweet yet mild flavored Oyster, these are for you! Order Your Fresh Salt Pond Oysters By 10am EST, And Enjoy Them For Dinner Tomorrow! Oysters Also Make A Great Gift Idea For Your Favorite Seafood Lover! How Easy Is That! You can easily place your order online or by calling us toll free at 866-788-0004. We ship Monday to Thursday for delivery on Tuesday through Friday (NO Sunday or Monday delivery). I've never had oysters this good before. They were the perfect size and incredibly fresh! Dave really knows what he's doing harvesting these things! Can't wait until next time! Some of the tastiest oysters we've ever had! Sweet and salty... just how we like em! We've never ordered food online before but we will be again very soon! Thanks! Great Oysters! Slurped every last one! We had these Oysters for Tailgating this weekend, and they were a huge hit! Sweet flavor was right on! We will be ordering again!